Even though Japan surrendered one year prior to publication of this book in August 1946, the Americans in this comic continue to battle Japanese planes and tanks. 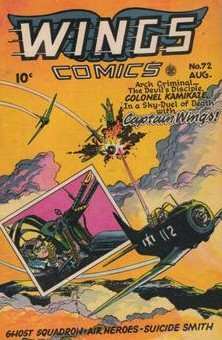 Captain Wings, a regular character of Wings Comics, fights Colonel Kamikaze, described on the cover as "Arch Criminal" and "Devil's Disciple." 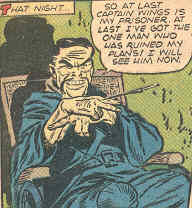 Wings Comics, one of several Fiction House comic magazines, began its monthly publication in 1940 and continued until 1954. This aviation comic book contained about five to ten separate regular features, many about air warfare. In the first story of this August 1946 issue, the Americans have captured and imprisoned the evil Colonel Kamikaze at an unnamed airfield, and Captain Wings plans to transport him to Tokyo for trial. However, Japanese planes bomb and strafe the airfield, and a female suicide pilot crashes into the building where the Colonel is being held in order to break him out of his cell. Colonel Kamikaze escapes to a group of tanks waiting just outside the airfield. Captain Wings makes it to a camouflaged plane, takes off, and tries to stop the tanks but ends up crashing. 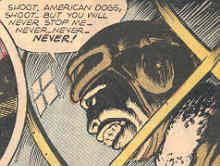 The Colonel puts Captain Wings into a torture chamber in order to stretch off his legs, but the Captain escapes and takes off in a stolen Japanese plane. Colonel Kamikaze follows after him but gets shot down and dies in an air battle. The book's last regular feature, "Ghost Squadron," is a war story mixed with supernatural elements. Right after a Japanese sub hits the American aircraft carrier Ironsides, a kamikaze pilot in a Betty bomber dives into the carrier to sink the ship. Later in the war, a pilot who survived the Ironsides' sinking finds himself shot in his damaged plane, and he barely manages to land on the ghost carrier Ironsides manned with men who had perished in the sinking. The ghost commander treats him kindly, even though the pilot had fought with him while he was alive and had discredited him at the board of inquiry regarding the sinking. 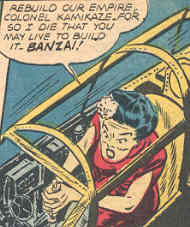 As seen from the three images below, this comic book's two stories of "Captain Wings" and "Ghost Squadron" portray Japanese suicide pilots as crazed figures. Even though a year had passed since Japan's surrender, the character of Colonel Kamikaze, depicted as a vicious madman, closely resembles racist images of Japanese published by Americans throughout the war. The Colonel exemplifies President Truman's view, as recorded in a July 1945 diary entry, of Japanese as "savages, ruthless, merciless, and fanatic."